I was unfamiliar with the work of Nicola Lancerotti, an Italian double bassist and composer based in Brussels, before giving this disc a blind spin. It is loosely improvised and tightly composed, balancing on a tightrope not only in approach but also texturally. Lancerotti's quartet presents his compositions in the best possible light, while also taking them on lively detours via group improvisation. That said, there are five improvised bits – at least I think they're improvised - spaced throughout to break things up a bit. Like I said, it's about balance. One of the short group improvisations opens the disc (“Quartet I”), and sounds a bit more composed than then others. The entire band, led here by reed men Jordi Grognard and Daniele Martini play freely, enveloping the listener in slowly cascading waves. The second improvisational piece to appear is “Trio,” all of 51 seconds on which one of the tenor saxes lays out (not sure which one, as both Grognard and Martini play tenor). “Quartet III” almost hits the four minute mark, beginning with a slow free dirge from Lancerotti that manages to stay in the hull of the ship even after the other drunkards join in, creaking and wheezing under the night sky. A spacious reed and drums duo tiptoes around the attic on “Duo,” while “Quartet IV” features more tentative drunken pirate interplay, closing off the disc in a manner reminiscent of Gil Evans' “Sunken Treasure”. The first composition on the disc, “Faking East,” opens with a few droning 2-note chords played by Grognard and Martini vamping over a lightly swinging rhythm that wouldn't sound out of place on Dolphy's “Out To Lunch” album. As the music progresses, a tinge of Altlantic-era Ornette Coleman Quartet is detected. 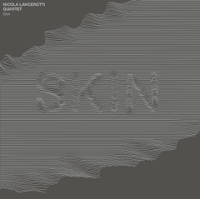 Lancerotti takes his first sublime solo on this track as well. There is another Dolphy flashback on the next track, “T.T.F.K.A.C.” but this time it's Chico Hamilton's group, complete with drummer Nelide Bandello leading the way with mallets strategically directed at his toms and cymbals. The track is soft, somber, meditative, and features beautiful melodies throughout. I was disappointed for a few seconds that “Why?” wasn't a Yoko Ono cover, but disappointment turned to sheer joy after a couple of minutes of this, the longest track on the album. It opens with Lancerotti alone, followed by Grognard and Martini riding a slow groove with carefully constructed melodic and harmonic lines, reminiscent of a Mary Halvorson composition. Martini takes a sax break, followed by Grognard on flute, including the occasional Roland Kirk vocalized exhale. This track clocks in at 8:53, but it feels like it's over in half that amount of time. The farthest “out” playing on the album can be heard on “La Quiete Prima Della Tempesta,” as Grognard takes the bass clarinet out for a mud bog, followed by an outbreak by Martini on soprano sax. Amazingly, there is still a very evident showing of cohesiveness in the band and they remain united in purpose even as Martini goes batshit near the end. If “Why?” is the most successful composition on the disc, then “La Quinte” functions as the real showcase piece for the band. Lancerotti's tunes are worth checking out every bit as much as the band that brings them to life. This is quality stuff worthy of your attention.